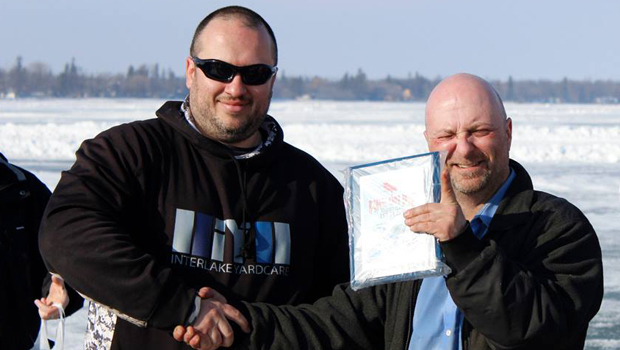 Steven Bradley, Gimli, Manitoba (March 5) The Winnipeg Sports Car Club (WSCC) wrapped up their 2017 Winnipeg Truck Exhaust, Fire on Ice Racing season over the March 4th and 5th weekend were they headlined Gimli’s annual Ice Festival. 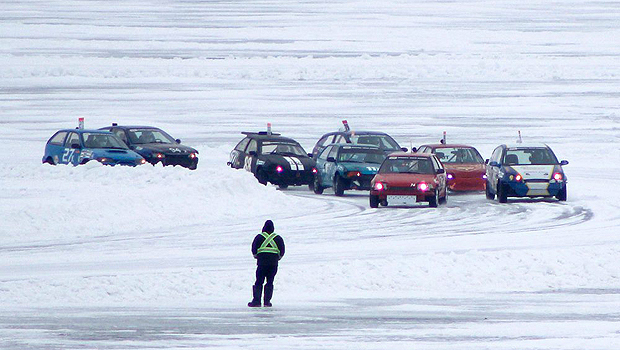 16 race teams tackled Gimli Beach looking for maximum points in their farewell weekend. Mercedes-Benz AMG tracks occupied the club’s usual space, so the WSCC decided to challenge their drivers on a track that is mainly used for measuring car performance – not necessarily competing on. With a very slight modification to turn 1, the club turned an AMG circuit into an extremely challenging 1.25km track. 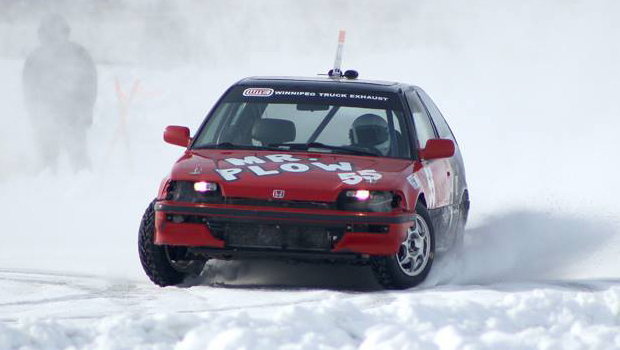 Even the most skilled ice racers had their hands full on this performance track. The weather stayed above freezing on both days, with Sunday reaching a balmy 4 degrees in the sunshine. Despite the track being a little bit of a walk from the shore, fans lined the track watching drivers take the checkered flag in 20 races. In the Studded division, Lee McRae won 5 out of a possible 6 races to seal his championship title in convincing fashion. Al Marcoux was the only other driver to find victory lane with a win in race 4. 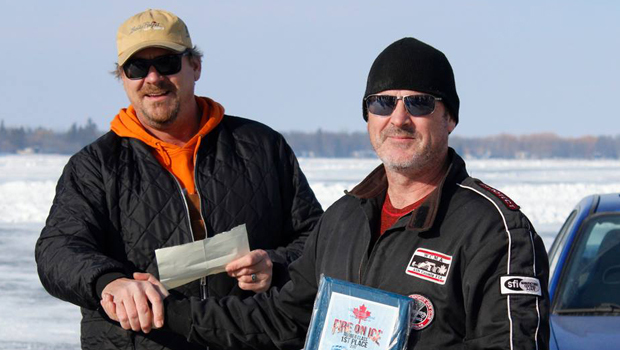 The Al Marcoux / Matt Levielle team surpassed the absent Colin Mckee for second in championship points. 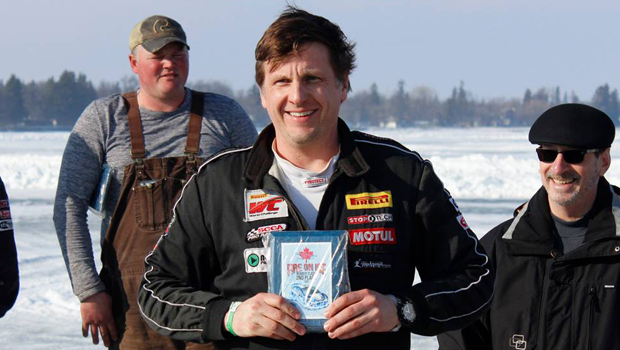 In the Rubber division, Damon Surzyshyn earned 6 wins in 12 races to stay on top of the leaderboard and collect the class championship. Mike Demchenko made a late charge – taking the checkers in 5 races and collected the most points over the weekend to jump into second in points. Andre Toupin battled mechanical issues which took him out of contention for the points title, but managed to earn a victory in race 3. In a 30 minute season farewell studded endurance race, Al Marcoux climbed 5 positions and got by Peter Jakabec with 2 laps remaining to end his season in victory lane. In Studded race 1, Lee McRae inherited the pole based on point standings and opened up a big lead when the green flag dropped. While Al Marcoux and Peter Jakabec were in a tight battle for second, McRae easily stayed on the point and collected his first win of the weekend. Marcoux edged Jakabec for second while Wayne Kehler and Marlene Jakabec rounded out the top 5. 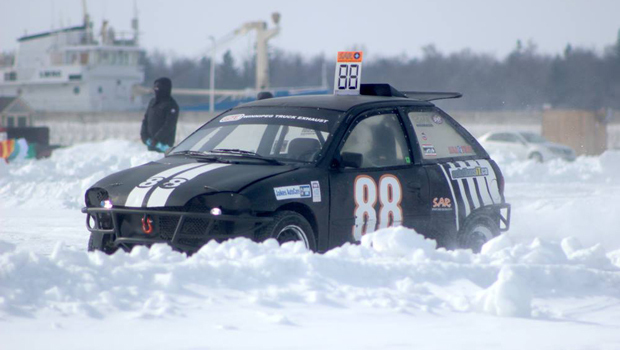 In Studded race 2, the race was reset after a small pile-up high entering turn 1 when Peter and Marlene Jakabec got stuck in an unsafe spot. After officials safely removed both drivers from the corner, the pack lined up for a complete restart. Al Marcoux jumped from third to first on the opening lap while Lee McRae got by Jamie Gillespie on the first circuit to secure second. Over the next 8 laps, McRae stayed glued to Marcoux’s back bumper, and after some great side-by-side racing, completed a pass for the lead in turn 3. McRae collected the checkered flag just 1 second ahead of Marcoux, while Gillespie, Peter Jakabec and Wayne Kehler each earned top 5 placings. In Studded race 3, Marlene Jakabec got her first taste of clean air after starting on the pole – competing in her first race weekend of the season. Jakabec held her lead for the opening 2 laps until she slid wide in turn 3 – opening the door for Jamie Gillespie to squeeze by and secure the point. Peter Jakabec blew by Marlene and set his eyes on the leader. On lap 5, Al Marocux knocked Marlene Jakabec out of the top 3 after completing a pass in turn 6. On lap 6, officials called race leader, Jamie Gillespie into the pits after his front lights malfunctioned. 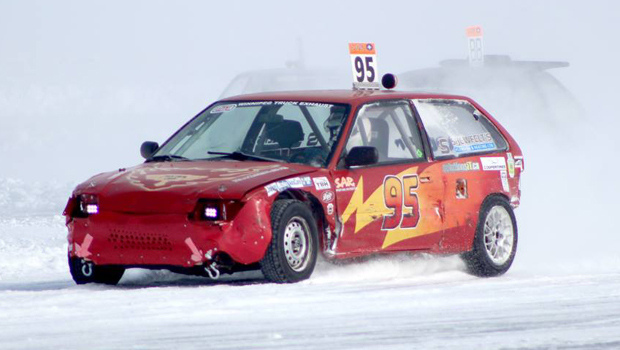 According to the rulebook, all cars must have at least 1 working headlight to stay in a race. Reluctantly, Gillespie surrendered his lead and pulled into the pits. As Gillespie was pitting, McRae had just completed a pass on both Marcoux and Peter Jakabec for what he thought was for second, but was in fact for the lead. McRae collected his third win in a row, while Marcoux completed a last corner pass on Peter Jakabec for second. Marlene Jakabec and Wayne Kehler rounded out the top 5. In Studded race 4, Jamie Gillespie lead the field to green from the pole. On lap 2, Al Marcoux completed a pass low on Marlene Jakabec entering turn 1 to move into second position. It only took Marcoux 2 more laps to catch and pass Gillespie in turn 7 to take over the lead. Marcoux began encountering lap traffic on lap 8 when he put Wayne Kehler down a lap. Marcoux easily collected his first race win of the weekend ahead of Gillespie in second. Marlene Jakabec held off the pressure from her husband, Peter all race long to finish in third, while Kehler collected a top 5 finish. In Studded race 5, Peter Jakabec used the outside front row starting spot to take the lead – with Jamie Gillespie jumping a pair of positions to move into second. On lap 2, Al Marcoux outraced Gillespie down the short front stretch to steal second position. After sitting out the previous race to address power steering issues, Lee McRae climbed from last to third after he got by Gillespie in turn 3. On lap 3, Marcoux squeezed under Peter Jakabec entering turn 1 to take over the lead – opening the door for McRae to follow by and secure second. 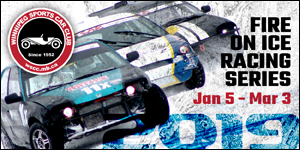 On lap 6, Marcoux coughed up the lead after a run-in with a snowbank in turn 6 – handing the point to McRae. Marcoux began to slow and limped his way to the pits with reported radiator problems. Gillespie was the next casualty of the race after his car died in a pile of steam in the exit of turn 1 – which we later found out to be an expired transmission. Back up at the front, McRae raced unchallenged to his fourth checkered flag of the day. Marlene Jakabec survived to finish in the runner-up position, while Peter Jakabec was the only other car to complete the race – earning a third place finish. In Studded race 6, Al Marcoux led Jamie Gillespie through the opening laps. On lap 2, Lee McRae picked up 2 positions when he got by Peter Jakabec in turn 4 for third position. Just 3 turns later, McRae got by Gilespie for second spot and started to cut into the pole sitter’s lead. By lap 7, McRae had caught Marcoux for the lead, but a bobble in turn 7 let Marcoux once again open up a sizeable gap. On lap 8, Gillespie must have miscalculated his fuel milage because in turn 5 his car used the last drop of gas and came to a stop. On lap 9, McRae once again caught Marcoux for the lead as they battled side-by-side down the front stretch for the lead. On the last lap it looked like Marcoux would hold off the pressure and collect the win, but 50 feet from the checkers Marcoux’s front axle let go and he slowed to a stop. McRae happily raced by to earn his fifth win of the day – ending his championship season wrapped in back and white. Marcoux glided across the finish line to finish second, while Peter Jakabec finished the race ahead of Marlene Jakabec for third. Lee McRae won the 2017 Studded class championship by accumulating 118 points, where he earned 14 wins in 22 starts. 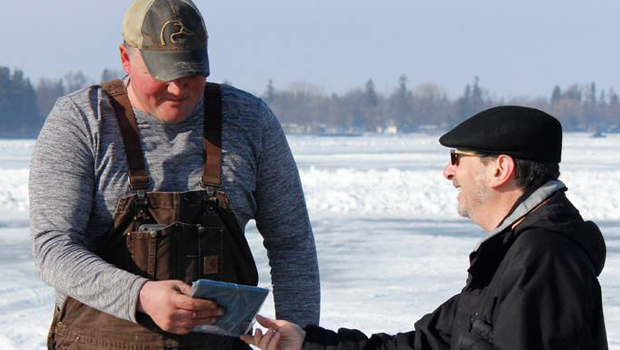 The Al Marcoux / Matt Levielle team finished in second with 62 points where they collected 3 wins in 17 starts. Colin Mckee, who was absent this weekend, finished top 3 in points with 60, where he earned 4 wins in 18 starts. In Rubber race 1, Andre Toupin beat Damon Surzysyhn to the point from the front row, however on lap 2 Surzysyhn regained the lead after a pass on Toupin in turn 5. The weekend didn’t get off to a good start for Steve Leiding as his engine expired after just 7 laps. Surzysyhn maintained the point for the rest of the race as he collected the win 2 seconds ahead of Toupin. Mike Demchenko, Chris Dueck and Jared Halpin rounded out the top 5. In Rubber race 2, Jared Halpin beat Jim Antosko to the point from the front row. On lap 3 Mike Demchenko climbed 2 spots when he passed Antosko. Demchenko then took over the lead on lap 4 after getting by Halpin in turn 5. On lap 6, Andre Toupin knocked Antosko out of the top 3 after a pass down the front stretch. Halpin coughed up the runner-up position when he looped his car in turn 6 – handing second position to Toupin. Toupin then gave up his position when he spun alone in turn 7 on the following lap – handing second spot over to Damon Surzysyhn. Back up at the front, Demchenko easily scored his first win of the weekend, ahead of Surzysyhn in second. Toupin recovered nicely and made a last corner pass on Halpin for third while Chris Dueck rounded out the top 5. In Rubber race 3, Chris Dueck took the early lead as Andre Toupin climbed 2 spots by lap 2 to overtake second position. On lap 3, Mike Demchenko picked up 3 spots and completed a pass on Antosko in turn 4 to secure third position. On lap 6, Toupin snuck by Dueck for the lead in turn 5. 3 laps later, Demchenko caught Dueck for second as they swapped positions – eventually Demchenko claimed the position after a sweet cross-over pass exiting turn 1. Toupin managed to stay on the point and collected his first win of the weekend ahead of Demchenko. Dueck, Surzysyhn and Halpin each finished in the top 5. In Rubber race 4, Andre Toupin used the high line to whip around the 3 cars ahead of him to steal the lead. On lap 2, Mike Demchenko moved into second after completing a pass on Jim Antosko in turn 5. Antosko fell another position when Chris Dueck snuck by in turn 7 of the fifth lap. On lap 6, Demchenko finally got by Toupin after applying pressure and moved to the point. On lap 9, Toupin’s front axel let go – forcing him to limp around the track and trying to avoid a DNF. Demchenko easily collected his second win in a row, ahead of Dueck, Surzysyhn and Antosko. Toupin managed to limp across the finish line with a fifth place finish. In Rubber race 5, Andre Toupin outraced Jared Halpin out of the first corner to take the early lead. On lap 2, Mike Demchenko climbed 4 positions when he got by Halpin in turn 6. On lap 4, Damon Surzysyhn clawed his way into the top 3 when he got by Halpin in turn 4. Over the next handful of laps, Demchenko looked high and low for a way to get by the leader, and eventually on lap 8, managed to sneak by Toupin in turn 6 and move to the point. Demchenko scored his third win in a row, while Toupin finished in second ahead of Surzysyhn, Halpin and Dueck. In Rubber race 6, Damon Surzysyhn passed 3 cars on the opening lap to steal the lead while Mike Demchenko followed close behind – picking up 4 spots to secure second. On lap 3, Andre Toupin and Jared Halpin came together which resulted in Toupin’s tire getting cut and forcing him to the pits for a tire change. Toupin would take a hit in points, and re-entered the race 2 laps down. Nothing more changed as Surzyshyn stayed on the point to collect his second win of the day. Demchenko finished a close second while Halpin, Antosko and Tim Gordienko finished with top 5s. After the first day of racing, a consistent day for Damon Surzysyhn added 6 markers to his points lead which now stood at 15. Mike Demchenko moved by Andre Toupin for second after some bad luck in the #95 pit. Demechenko sat 15 points back of Surzysyhn, while Toupin sat 1 point behind Demchenko in third. In Rubber race 1, Mike Demchenko beat pole sitter Damon Surzysyhn out of the opening corner to take the early lead. The top 3 drivers raced within a couple seconds of each other for the first half of the race, but eventually strung out as Demchenko was able to hold the lead for the entire race and collect the win. Surzysyhn finished in second ahead of Andre Toupin while Lee McRae Jim Antosko and Jared Halpin each scored top 5 placings. In Rubber race 2, Lee McRae who switched his studded tires for rubbers, used a front row starting spot to lead early. On lap 3, Damon Surzysyhn made an outside pass on Andre Toupin in turn 4 to move into second spot. 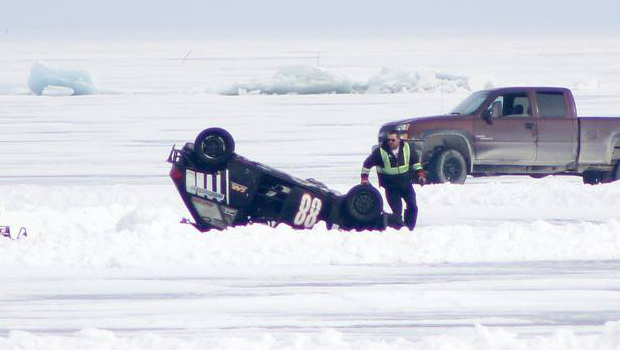 Later on lap 3, Toupin’s bid for back-to-back championships suffered a blow after he parked his ride backwards in a snowbank in turn 6. Back up at the front, Surzysyhn and McRae swapped the lead back and forth until Surzysyhn finally secured the point on lap 6. Surzysyhn maintained the lead and collected the victory ahead of McRae. Jared Halpin, Mike Demchenko and Jim Antosko all finished in the top 5. In Rubber race 3, Mike Demcehnko wasted no time climbing 2 spots to take the lead on the opening lap. On lap 2, Surzysyhn got by McRae for second as he worked to keep Demchenko, and his points lead, in site. On lap 5, Andre Toupin moved McRae out of the top 3 after completing a pass in turn 5. Toupin moved up another position when he snuck by Surzysyhn for second place on the following lap. As the race wore on, Toupin and Surzysyhn battled hard for second which enabled Demchenko to separate himself from the pack and walk away with the win. Toupin managed to hold off pressure from Surzysyhn to finish second while Jared Halpin and Lee McRae rounded out the top 5. In Rubber race 4, Lee McRae used a front row starting spot to secure the lead while Damon Surzysyhn climbed 2 spots to steal second spot. On lap 2, Mike Demchenko completed a pass on Jim Antosko for third position in turn 1 and moved into third. 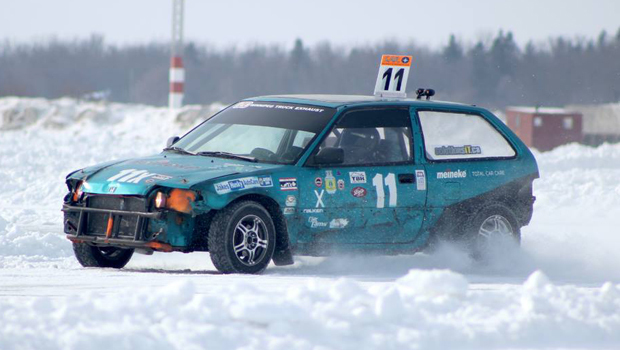 On lap 7, the battle for the lead heated up as McRae and Surzysyhn raced side-by-side past the finish line – which was reeling in third place Demchenko. On the last lap, Surzyshyn eventually got around McRae in turn 3 to move to the point. McRae surrendered second spot when Demchenko squeezed by just 3 corners later. Surzysyhn collected his second win of the day, ahead of Demchenko, while McRae, Jared Halpin and Andre Toupin each finsihed in the top 5. In Rubber race 5, Andre Toupin beat Jim Antosko to the lead when the green flag dropped, but was soon overtaken by Lee McRae who stole the point in turn 5. Toupin fought back and regained the lead 2 laps later in turn 4. On lap 3, Demchenko’s attempt to catch the point leader began dwindling after he clipped the outer snowbank in turn 3 and watched Surzysyhn drive by for third. Back up at the front, McRae once again took the lead after a last corner pass on Toupin on lap 4. Toupin fell another position when Surzysyhn squeezed by in turn 6. Demchenko also got around Toupin on lap 6 in an attempt to keep Surzysyhn within striking distance. However, Surzysyhn distanced himself from Demchenko on lap 7 when he got by McRae for the race lead in turn 2. Surzysyhn easily scored the win ahead of McRae while Demchenko, Toupin and Halpin finished in the top 5. By finishing this race, Surzysyhn had built enough of a point lead to claim the 2017 Rubber division title, without needing to start the final race. In Rubber race 6, Mike Demchenko eventually emerged from the opening lap with the lead after starting fourth. On lap 2, both Lee McRae and Damon Surzysyhn got around Andre Toupin in turn 1 to form second and third. It took 4 laps for Surzysyhn to catch Demchenko, but on lap 7 he got by the leader in turn 3. Demechenko drove his heart out and passed Syrzysyhn back in turn 5 to regain the lead, however on the next lap Demchenko clipped the exit of turn 2 and two-wheeled the entry to turn 3. Demchenko wasn’t able to recover, and he flipped his car over low in the turn 3 entrance. Officials red-flagged the race and with just 2 minutes remaining, called the race complete. Demchenko was checked out by medical staff and was cleared to continue racing with his car taking on minor cosmetic damage. 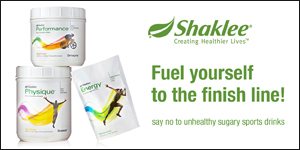 Surzysyhn was awarded the win with Demchenko placing second. McRae, Toupin and Halpin each collected top 5 finishes. Damon Surzyshyn earned the 2017 Rubber points championship with 220 points made up of 14 wins in 34 starts. Mike Demchenko finished second in standings, 23 points back of the leader with 8 wins in 34 starts. Andre Toupin finished third in standings, 44 points back of the leader with 7 wins in 30 starts. 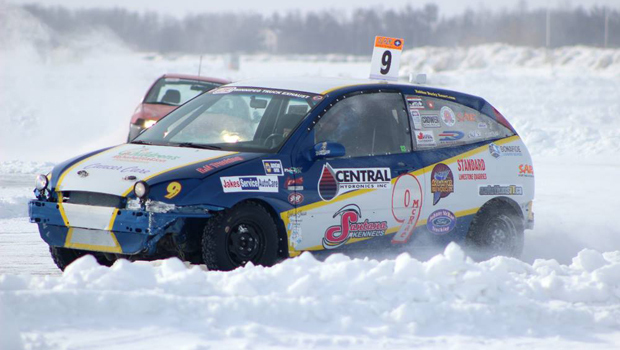 To wrap up the 2017 season, the WSCC invited all racers to bolt on a set of studded tires and compete in a farewell 30 minute endurance race, that was broken into 2, 15 minute segments. 9 drivers formed the starting grid and starting spots were drawn from a hat. Jamie Gillespie drew the pole position with Rubber points champion, Damon Surzysyhn starting to his right. Marlene Jakabec and Tim Gordienko formed the second row. When he green flag was displayed, Al Marcoux wasted no time climbing from sixth to third in the opening few turns. On lap 5, Marcoux got by Marlene Jakabec in turn 5 for second spot just as Lee McRae was passing Peter Jakabec for fourth. On lap 6, Marlene Jakabec opened the door for McRae to rob her of third position. Just a couple corners later McRae also got by Marcoux for second spot in turn 4. On lap 10, Marlene Jakabec’s opening segment ended when her car began smoking – forcing her to the pits and finishing 4 laps down. On lap 13, McRae caught and passed Gillespie on the front stretch to take control of the lead. Marcoux managed to catch Gillespie for second as the pair swapped position over the next couple laps – allowing the leader to open up some space. McRae’s chances of winning eventually ended when his car lost power and began slowing through the back half of the track. McRae pulled to the pits which handed the lead back to Gillespie. After the first 15 minute segment was completed, Gillespie was scored in first place, Marcoux in second and Peter Jakabec in third. To start the second and final 15 minute segment, like was done all season, officials inverted the top 6 placements. 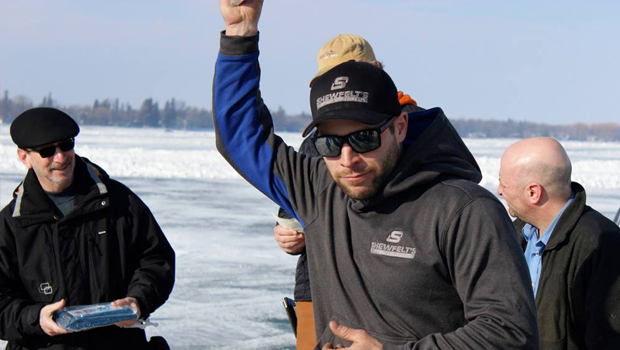 This put Rubber division rookie, Jared Halpin on the pole with Damon Surzyshyn to his right as Bruce Stewart and Peter Jakabec formed the second row. As the field jockeyed for position over the opening lap, Peter Jakabec emerged from the last corner with the lead – ahead of Damon Surzyshyn. On lap 2, Jamie Gillepsie got by Surzyshyn in turn 3 to secure second spot after reports of contact between the drivers – which was evident from the bright orange bumper dragging from Gillepie’s car. Just 3 turns later, Marcoux completed a pass on Syrzysyhn for third. On lap 3, Marcoux completed a pass on Gillespie for second in turn 5 just as Gillespie was being summoned to the pits, for the second time of the weekend, to address the hanging debris from his car. After a few laps, Gillespie eventually pitted and got the bumper removed – rejoining the field on the lead lap. On lap 5, Bryce Stewart got around Surzyshyn in turn 6 to move into third position. On lap 11 after applying pressure on the leader, Marcoux managed to make a pass on Peter Jakabec to secure the point. With time winding down, Marcoux began encountering lap traffic on lap 13 when he put Gillespie down a lap in turn 1. Despite lap traffic, Marcoux managed to keep the passing lanes shut, as he held off Jakabec for the win. Peter Jakabec finished a respectable second while Bryce Stewart, Tim Gordienko and Damon Surzyshyn finished their seasons with top 5 placings.